Syria Solidarity UK: Break the sieges! Air drops now! Join us 6pm every day this week at Downing St. Break the sieges! Air drops now! Join us 6pm every day this week at Downing St. Please join us at Downing Street, London, 6pm daily all this week. We are calling on the UK to keep their promise to Syrians and start humanitarian air drops from 1st June. Concern is growing that the United Nations is backtracking on plans to use airdrops to send food and urgent medicine to besieged towns in Syria, amid indications that the organisation believes the tactic is too dangerous without the support of the Syrian government. A meeting of the International Syria Support Group (ISSG) on 17 April in Vienna said it would start airdrops from 1 June if Bashar al-Assad’s government continued to block World Food Programme aid and prevent land convoys reaching besieged areas. The decision was passed unanimously by the 20-plus countries in the ISSG, including the US and Russia, and was hailed as a breakthrough by the British foreign secretary, Phillip Hammond. 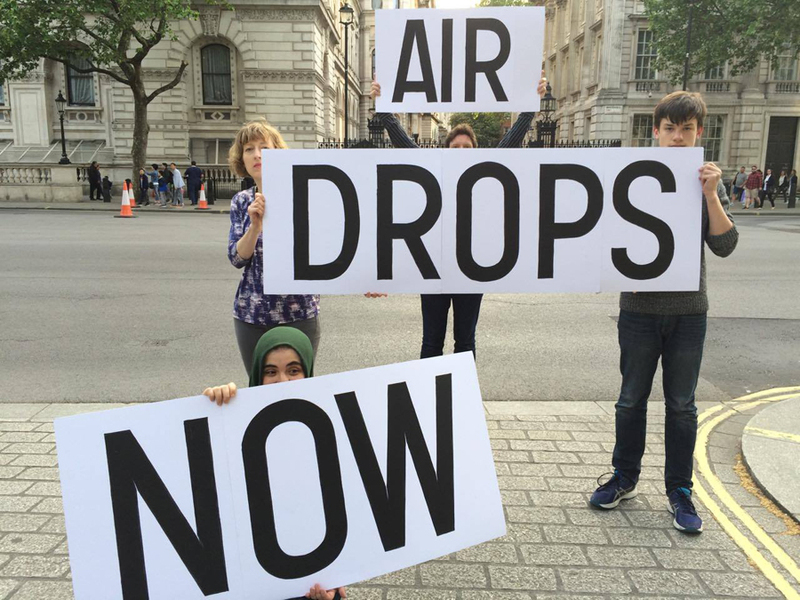 Email your MP about humanitarian air drops here. Join us at Downing Street, 6pm every day this week, to call for humanitarian air drops. If the UN won’t do the job, the RAF can and should.